On September 15, NASA's flagship robotic explorer, Cassini, will plummet into Saturn's atmosphere in a fiery burn-up, ending a thirteen-year career of exploring Saturn and its host of remarkable moons. As Cassini readies itself for the dramatic end-of-mission blow-out, we can take some time to reflect on a few of its most remarkable discoveries and achievements. Early in its mission, in 2005, Cassini dropped the European Space Agency's Huygens probe onto the surface of Titan, Saturn's largest moon. This remains the most distant landing in our solar system to date. 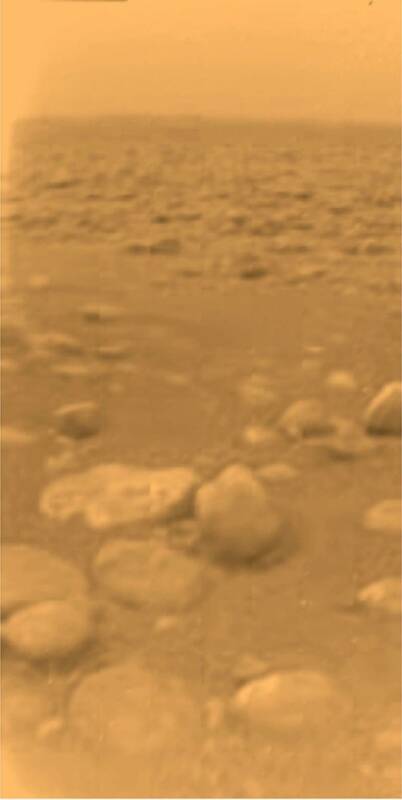 Huygens parachuted through Titan's thick nitrogen atmosphere and hydrocarbon haze, measuring atmospheric pressure, temperature, and composition, as well as recording sounds with a microphone during the nearly 2.5-hour descent. Huygens captured images of the landscape below as it descended, and pictures from Titan's surface following its successful landing—the first images from the surface of any object in the outer solar system. Also in 2005, Cassini discovered plumes of water vapor erupting from the tiny moon Enceladus. The gases, emerging from long crevasses near the south pole, included other chemicals, such as nitrogen, methane, and carbon dioxide. In 2008, Cassini also detected propane, acetylene, and formaldehyde in the geyser plumes. Further measurements from several flybys of the moon fueled the hypothesis that Enceladus possesses a saltwater ocean hidden deep under its icy crust. Even more tantalizing, the evidence suggests that there may exist hydrothermal vents spewing hot, mineral-laden water on the ocean's floor. 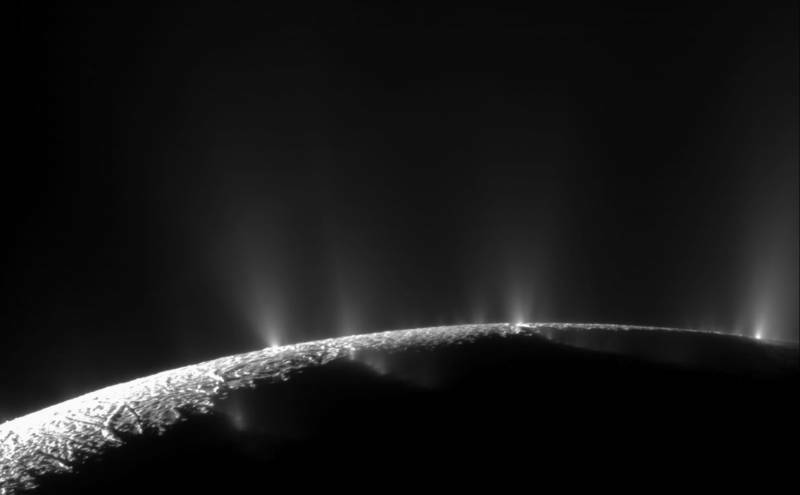 This makes Enceladus a very hot prospect in the search for locations beyond Earth that could support some form of life. Hydrothermal vents in our own oceans support thriving communities of life forms. Cassini's many years of observations of Saturn's icon rings have revealed their dynamic nature in ways that single "snapshots," such as images captured during the brief fly-bys of Voyagers 1 and 2, could not, and in much finer detail. Not only have scientists analyzed the dusty, icy composition of the rings, they have discovered tiny moons, near and even orbiting within the rings, sculpting the ring material into repeating waves, ropey filaments, and other intricate and beautiful patterns. 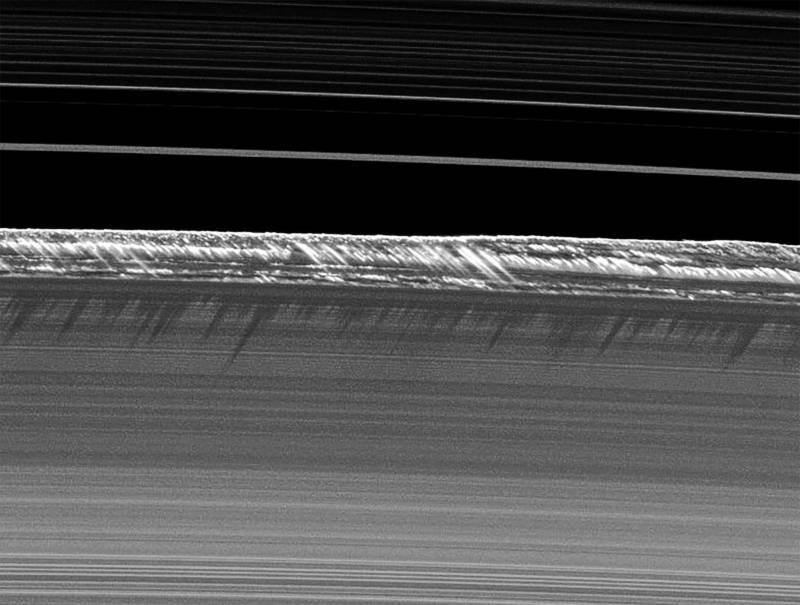 Cassini has even seen, in some locations, vertical structures rising in rows of feathery, spiky fringe high above the rings. These features are caused by the passage of a tiny "moonlet" orbiting Saturn nearby, which disrupts the ring's otherwise flat plane. An image taken in 2013, showing a bright "knot" within the outermost of Saturn's bright rings, may prove to be a new moon forming out of the ring material. If so, then Cassini's ring observations may tell us something about the formation of some of Saturn's other small, icy moons. Titan: A Cold, Primordial Earth? 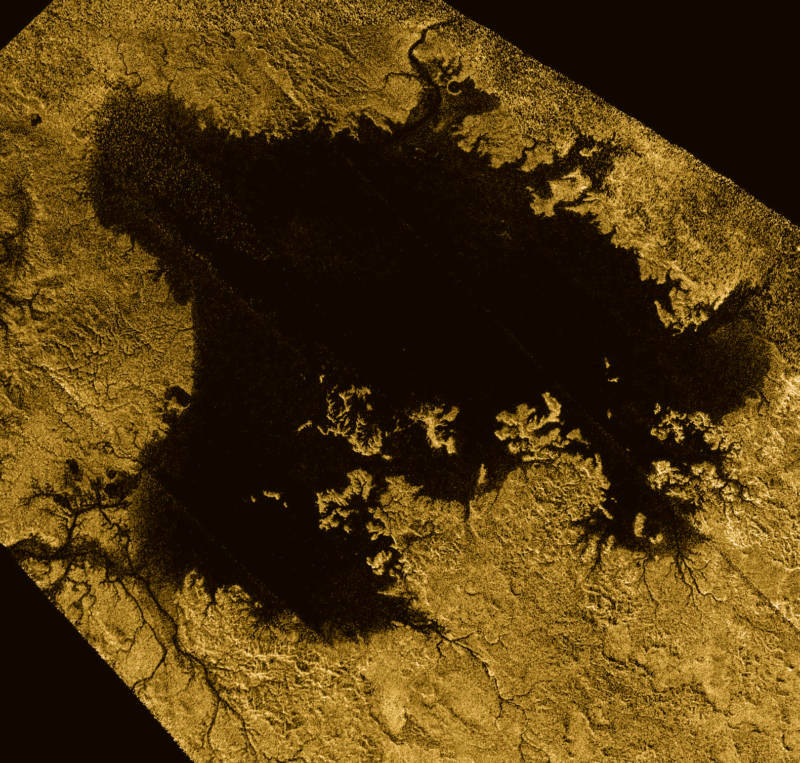 One of the most intriguing characters in the Cassini-Huygens mission is Titan. 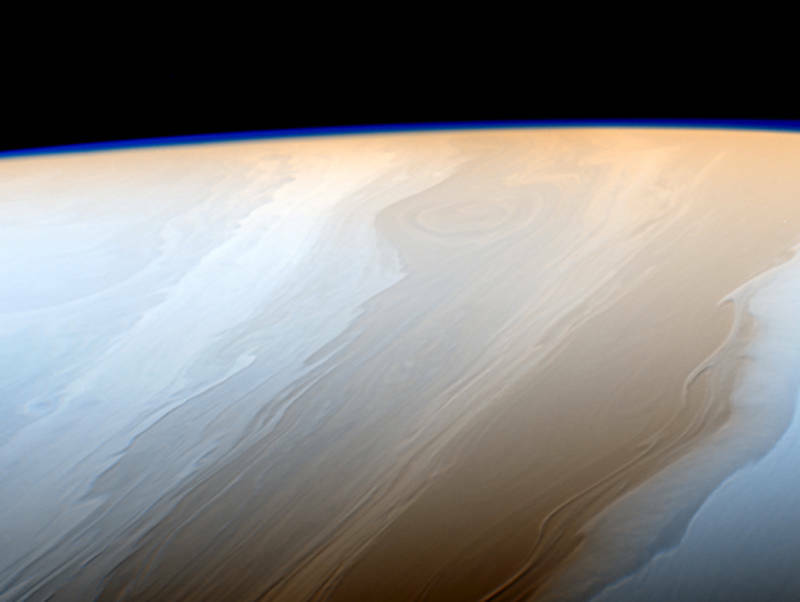 Saturn's largest moon happens to be the only one in the solar system with a thick atmosphere. The Voyager missions, passing through the neighborhood in the 1980s, were the first to see Titan's atmosphere and its obscuring shroud of hydrocarbon "smog." Cassini, and the Huygens probe, however, have revealed it in rich detail. Though cold in the extreme, Titan's dense nitrogen, hydrocarbon-infused atmosphere has proven to support a liquid cycle, analogous to Earth's water cycle, but dealing in cryogenic liquid methane and ethane instead. Precipitation collecting in extensive river-like drainage networks feed into large lakes and seas, one comparable in surface area to Lake Superior in North America. Complex hydrocarbons are found on Titan, a product of photo-chemical interactions of sunlight and methane high in the atmosphere. These organic molecules form Titan's "smog" layer, and precipitate downward to supply the liquid cycle on the surface. Though cold enough to liquefy methane--a gas on Earth--Titan has been likened to a primordial, pre-biotic Earth, and in studying it we may be catching glimpses of our own planet's beginnings. Cassini is now in the final phase of its so-called "Grand Finale" tour, looping through a wildly eccentric polar orbit that sends it skimming repeatedly between Saturn's rings and cloud-tops. This final and daring maneuver, Cassini's "swan song" of Saturn exploration, is giving us our closest, most detailed vistas ever of the gas giant and its famous rings. Cassini is also making magnetic and gravitational measurements during each close pass that promise to tell us something about Saturn's internal structure. And, as it makes its ever-tightening swings closer to the atmosphere, it will ultimately sample the planet's chemistry directly, becoming the first spacecraft to touch the skies of Saturn. 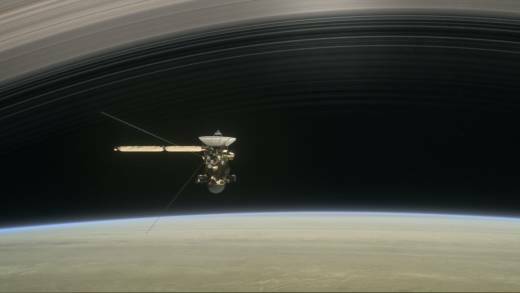 When Cassini finally plunges into Saturn, friction with the atmosphere will generate intense heat, and Cassini will be vaporized. After 20 years in space (seven years traveling to Saturn and 13 years in orbit), Cassini is running low on the rocket fuel used to adjust its trajectory. Once its fuel is depleted, the spacecraft would otherwise become a derelict that could crash into a moon. With the possibility of life-friendly environments on at least one or two of Saturn's moons, NASA's end-of-mission ethic is to safely dispose of the spacecraft to eliminate that possibility. Farewell, Cassini, and thanks for all the wonders you have brought us!